​ERB’s 11th and final novel in the Barsoom series is for the first time published by ERB Inc. and G&D in a Signed/Numbered Set (#1-348) - with different dust jackets, bindings (red & blue), and front/end matter – individual custom slipcases and a new Foreword by Kevin J. Anderson and an updated Introduction by Richard Lupoff. The G&D edition of John Carter of Mars will be the 50th authorized ERB title reprinted by G&D since they published their first title, A Princess of Mars, 100 years ago. SAVAGE PELLUICAR – ERB’s seventh and final novel in the series is for the first time published by ERB Inc. and G&D. We have a few copies exactly like the numbered editions except they are designated as "PC" or Publisher Copies. The set includes different dust jackets, bindings (red & blue), and front/end matter -- and a new Foreword by Richard Lupoff and Preface by Phillip R. Burger. - Two matching number books signed by the contributors. +B&W Illustrations by Takebe, Ivie, St. John and Grindberg. - Custom Slipcases, High Quality Paper and Bindings - 80# Finch in a vellum finish, vintage style book cloth, map endpapers, bookmarks and sewn bindings. - First Time in Hardback: ERB’s unpublished dj blurb, 2-page illustrated title pages for each of the four novellas. For more than three decades, the Reverend Henry Hardy Heins’ A Golden Anniversary Bibliography of Edgar Rice Burroughs (Donald M. Grant, 1962) was the gold standard reference book for American author Edgar Rice Burroughs’ writings. In 1996, Robert B. Zeuschner, PhD, a philosophy professor at Pasadena City College and a life-long Burroughs collector and enthusiast, delivered an updated and expanded bibliography: Edgar Rice Burroughs: The Exhaustive Scholar’s and Collector’s Descriptive Bibliography quickly became the authoritative reference in the field. Though Zeuschner’s book benefited from several decades of post-Heins research, his work was constrained by the publisher’s rigid format. Twenty years later, further expanded and revised, Zeuschner’s bibliography is now available in an aesthetic layout that enhances his decades of research. Titled succinctly Edgar Rice Burroughs: The Bibliography, the work has grown from 287 pages to more than 700, with 2,000 entries and 500 color illustrations. Zeuschner continued his practice of consulting fellow experts in the field to augment his own research, resulting in a well-vetted reference work that will swiftly gain recognition as the definitive Burroughs bibliography. 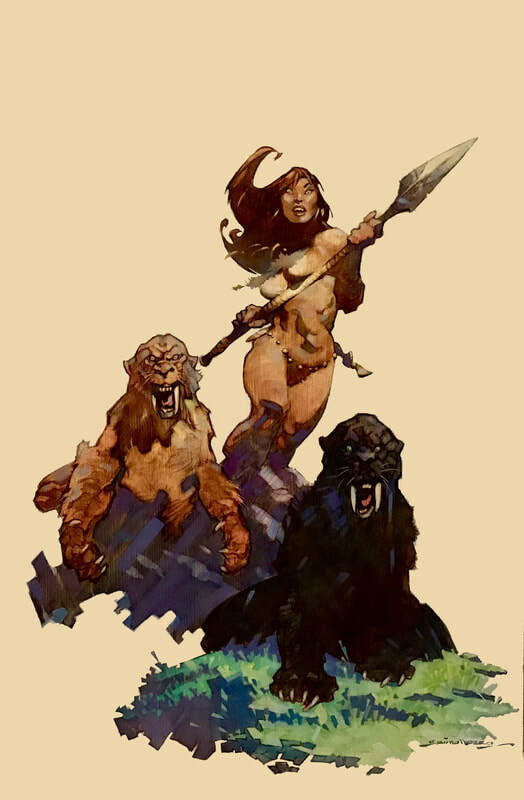 Edgar Rice Burroughs: The Bibliography, the first non-fiction book published by Edgar Rice Burroughs, Inc., was designed by Jim Gerlach, who crafted the beautiful 2015 Back to the Stone Age reprint for the company. Zeuschner’s book is available in two editions, the regular trade cloth edition, and a special leather-bound limited edition of 375 copies. The foreword is fittingly authored by Jim Sullos, President of Edgar Rice Burroughs, Inc.
Zeuschner hasn’t simply compiled a descriptive entry for every known U.S. edition of Burroughs’ work, hardbound, softbound and periodical, but has included abundant background materials to contextualize the historical relevance of the entries, such as the 15-page biography of the author that summarizes his career achievements and literary conventions. While not exhaustive, a list of books and periodicals about Burroughs (including biographies and bibliographies), the artists who illustrated his works, and on the films based on his books are included among the appendices, along with print runs of the A.C. McClurg and ERB, Inc. editions and other pertinent data. It’s enough to send collectors on a lifelong quest to track down missing editions or ephemera to enrich their libraries. The plentiful illustrations include samples of the books’ interior art, Burroughs’ correspondence, personal inscriptions, original manuscript pages, and advertising material. Four 16-page sections of color plates include every Burroughs pulp magazine cover, the first edition books and their dust jackets, Grosset & Dunlap reprints, and paperback covers from 1940-75. Zeuschner’s work was an indispensable reference for me when writing, Tarzan: The Centennial Celebration (2012), and I’m glad this seminal effort has been updated and released in a format befitting the author’s life-long labor of love. For more information, visit www.erbbooks.com . Sign up for our email updates. It will include offers on additional ERB books as they become available - both new publications and rare editions.